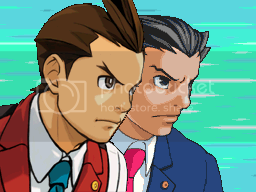 It's been three months since Apollo unearthed the truth concerning his mentor and Phoenix Wright's Disbarment. And life has gone on pretty much as it has before. Phoenix fights the Jurist System through committee by day, and plays poker by night. Trucy keeps her show at the Wonder Bar even while learning her grandfather's miracles. Apollo takes whatever wacky cases come his way courtesy of the "Wright Anything Agency." But the simplest part of a magic act comes just before the trick. Apollo soon finds himself caught up in a slew of cases where not everything is as it appears... Can he find the truth? Or will it disappear before his very eyes? Hey, I was browsing this forum not too long ago and I found a lot of OC sprite comics... but not a single one about Apollo! I mean, hey, I know it's kicking canon in the teeth and all that but... none? ...Seriously? Anywho, I decided to take the initiative with some old ideas I had lying around and --Voila!-- Apollo Justice: Witness the Truth was born. I have ideas for 4-5 cases with some made up (And no doubt hilariously wrong) insight into Magnifi Gramarye and Apollo's backstory. Page 2: And then he left... Like a Magician. Page 3: This is my sullen face. Page 5: Winston Payne Explains it all. Page 6: Contains a flashback...or three. Page 9: That's right people, we haven't actually had testimony yet. Page 10: Witness the Testimony! NOTE: This sprite comic assumes you have finished Apollo Justice: Ace Attorney. There will be spoilers for all the cases thereof and fewer explanations about how it ends. So if you don't want to be spoiled and/or COMPLETELY LOST, finish the game, kk? Last edited by Untaken Fingerprint on Sun May 23, 2010 8:18 pm, edited 29 times in total. Re: Apollo Justice: Witness the Truth! This sounds very interesting. It's hard to judge the comic at the moment since you only have the prologue but good luck. ...Now why would they do that? Nicely done! XD at the Hacky-sack. "What was will all the school tours on that block...? I see that you've edited the background and put one of the forged paintings on the wall instead of the old man. It looks good. Also, you aren't using the official PW font. jeti made a package (available on the PWlib homepage) so you should use that instead. Oops! Okay, I fixed it. Thanks for pointing that out. I'm glad you noticed! The Pufferfish was always my favorite of the paintings. It also adds a bit of color to the room. Thanks for the tip about the font. I know there had to be one somewhere but I couldn't find it. This is great! A comic about GS5! It's original, and I agree; why hasn't it been done? We should all kick canon in the face! Already I am curious... I can't wait for the next pages to come out. Thanks! Although if we all kicked cannon in the face... it would have no teeth. But while you're waiting, I made a court record that I can submit evidence too so you can all keep up with Apollo's Pocket without me having to spend panel-time dwelling on it. I always like to think that Valant and Trucy teamed up to do shows with the Gramarye Tricks. (Since Trucy doesn't know them, and Valant doesn't have the rights.) So now they did. Hurray! It's still hard to judge because you still haven't introduced the defendant however I like it. Also, the text looks much better now that you are using the official font. I agree, the text is much better. Also I like the Court Record! I love examining everything I have. I;m glad you like the court record. It will be more useful in about 3 pages when it will explode with evidence. Now you've met her. Frieda. You got a problem with it? On a side note, This will be the last page for a few days since, while I outlined the whole first case, I actually only scripted the first part of it before moving on. It's starting to get interesting. I'm looking forward to meeting Themis and Payne in court...only because I like Payne and Themis' design is very cute. Did you ever watch the Legend of Zelda TV series? That exact line was what Link used to say all the time. Also, there are a few grammatical errors, mainly with punctuation but that's it really. Nothing to worry about since they are very tiny. Did you ever watch the Legend of Zelda TV series? Man, I was thinking the exact same thing when I read it. This is pretty awesome and also interesting. I'm seriously wondering how this is going to work out, sould be cool. Yup It's a reference. I'm glad you noticed. And thanks for saying so. I'm always paranoid that my twists are too obvious since I like to do a bit of set up. I went ahead and posted this page since nothing much happened. However, I'm going to try and script the opening statement- breaking the first testimony before I do any more, okay? I made this very basic frame for animating court sprites so it might be of help to you. Just align the sprites on the lines. Also, your box art is good but it needs a tiny bit of work. I can see Trucy's coat in Apollo's frame. There is also a problem with the outline for Phoenix's frame. Okay, fixed and fixed. Thanks a lot for the crit. And, well... the next chapter will be quite a doozie, let me tell you. Lots of stuff to chew on. No problem. This method isn't the best however it works for court sprites. And basically, this is how you position Payne and Apollo's sprites on it. Pretty simple, right? For Apollo, it's a bit different. You can either download his .gifs and take the 256x192 frame and then place it onto the panel or use one of these two alternate methods. Both work but it's not the best with bigger sprites. Sorry, I'm also quite new to this so there is probably an easier method. No, it was very helpful, thank you! The Court Record EXPLODES with Evidence. ...and I guess there's some plot revelations or something. Anyway, I'm laughing because the scarf is called "Murderous Scarf." I'm trying to think if you purposely personified it or this was an accidental joke or I even misinterpreted it which I seem to do a lot lately. Good, I'm glad you like it! The next few pages got a little more intense than I expected when I was writing them, so I haven't quite reached my goal (Breaking the first testmony) but there's still enough material for a good set of pages. Actually I was just trying to go for the "Deadly Bottle" style of labeling.The scarf is the murderer. Oh well, since when was Ace Attorney Realistic. You'll just have to suffer through my art. I've been following along for a bit now, and thought I should post a comment now. Overall, I like your idea about what happens after GS4. I do like the idea of Phoenix help change the system for the better, instead of just being a defense attorney again. Plus, I am just fascinated about the whole story behind Apollo Justice, and like to see what other people think of it by inputting their ideas in fan-fics, comics and stuff like that. :D That's why I'm gonna try to follow this comic until the end. The keyword is "try". I'm usually not good at following things. Hehe. I like how you added a couple of flashbacks from Apollo's previous cases, or in this case, one case. :D And the quality of the new sprites are really well done. That's why I'm gonna try to follow this comic until the end. The keyword is "try". I'm usually not good at following things. Hehe. Well, I was replaying Turnabout trump when I realized how applicable all the quotes from it were. (And Kristoph... he gives good advice if nothing else...) As for the text I try to write for a 3 panel structure, but sometimes I mess up and it's hard to fix without majorly changing the layout of the page. (Thus 4 lines) I will work on it though, thanks for the crit. And I guess I thought that it was simply unrealistic for the Jurist system to be implemented after Turnabout Succession. It was, to be honest, a definitely NON STANDARD case. And there would no doubt be some people on the committee holding out and such. 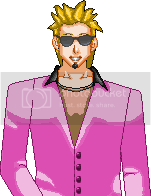 And well, this gives Phoenix something to do to keep in out of Apollo's hair until necessary. Apollo's backstory is the focus of case 5, which is quite a distance off. But I'll try to get there if you try to keep following, 'kay? Thanks! I'm glad you all like it! He was so close too! So unfair. The defense never gets a break. It's always been like that. :P But that is what makes the game so fun! Yup. Not even with Payne can the Defense get a break. Ever. Seriously, Apollo is more thoroughly screwed every time I write a page. ...And it's blood, okay? It's even red in the color version! There will be another short delay on the next page while I finish up a school project, but after that I should be able to get up until the first amended testimony before graphic constraints kick in. Is the defendant that strong to be able to throw the victim? Or am I not thinking straight...? It was more likely a body-slam into the wall, to catch by surprise. The concussive force was whiplash from being tackled. Very intersting comic you've got there, my friend. The plot seems promising, so I'll be sure to keep an eye on this. No, thanks a lot. I don't often go back to re-read pages, so it's very helpful for people to tell me about errors like that. And while I was fixing it, I went ahead and re-did the text for pages 0 and 1 so it's official Phoenix Wright Font. So, in the end I fixed a lot of stuff. It was a chain of fixage! Nice. I can't wait for the testimony! You will unfortunately have to wait one more page. But at least now you know who is testifying! Making the defendant testify? Since when has THAT been a good idea? btw,I'd like to ask you,can i use the court records thing for my comic? And of course you can use the idea, I made an external court record since it's the sort of thing that I'd like to use. If you use it than I get to use yours when reading your comic.